You guys are legends, thanks! Long post back was fantastic! It provided good way to watch the log live when it cycled through. Interesting why it hasn’t worked - here is what I had first (commented out) and what I used after which worked. If anyone can help me understand what I am missing as they look the same to me? I also seen that I was missing a known_devices_yaml file. If yo go to Configuration/General, and run a check config do you get any errors? It’s all working now with the “New Config” code but didn’t work with the “old config” code. Not broken into separate files yet. I am very green as i’ve only set it up a week ago! Thanks for the reply and I apologize for my late reply. I also had experienced major delays when running HA on my Rpi3. Ever since I moved my installation to a VM on my Proxmox server (running on a Dell R210ii), I saw no more delays from the service as a whole. Heck… I can restart the VM in about 10 seconds. lol. I just picked up a Hue motion sensor the other day so I’ll play around with it and HA and see what the delays are. Thanks. Moving on to my next brain injury - automation has been setup and looks to run in the logbook nicely; however, the service it calls for the light (it’s names correctly as far as I can tell) turns the light on; however, the light doesn’t turn on itself. Interestingly in the logbook it shows an icon as a little hamburger menu with a triangle rather than the light bulb when I turn the instance on with the entity switch. # Show the introduction message on startup. Thanks for answering. No it tends to come and go. I occasionally see messages that say HA cant connect to my bridge IP address so maybe that is related. All in all I’m thinking some issues are related to my infrastructure but of course these things can be difficult to nail down. Have I outgrown my pi and should I move on to a NUC(I ask myself). Is my router capable of handling my increasing number of devices or is HA in all of its lightning evolution the problem. In any case It seems like the template should define what to show when it gets a return of “nothing” like unavailable like with your lights but this is beyond my ability to template so far. You really have to become kind of become a small scale IT department when you take this on but its fun. My fiance thinks I’m crazy though lol. Still looking for that one automation that convinces her that I’m not wasting the hours I pour into this. unsure.. but upgraded to 0.78 and issue still persists. Thank you very much - Please, let me know why the code didn’t work? This has made everything absolutely so confusing now because I built that exact automation through the automations “wizard” you could call it. Reading your code it all makes alot of sense, I just can’t workout why the other method would not work? Please, let me know why the code didn’t work? the line with the entity: light.pantry_light shouldn’t have been there. I made the changes recommended in this thread and my Hue Switches are now working once more - but I have lost the ability to get them to display in their own tab. The tab shows nothing - whereas it used to show an entry to reflect each switch I have configured. Is that kind of state display no longer supported, or does it require a config change? 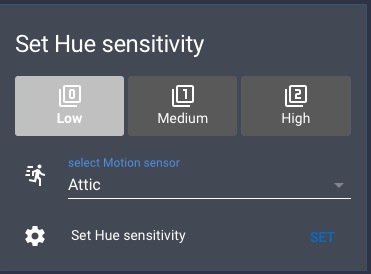 Has anyone noticed any difference with Hue motion sensor on older version where they are sensors and on the newer version where they are binary_sensors? I have automation that turns off lights according to humidity and with sensor that works really well but when motion sensors are binary_sensors once or twice a day the automation is not working and the lights are turning off even when there is motion. This is completelly fixed when downgraded back to 1.0.2 where motion sensors are just sensors. I have the same problem with motion sensors not always triggering lights. Can anyone help me with the settings on the motion sensor - if I stay in the same room it clears the motion but will not reactivate it… Is there a way to get around this? If I completely leave the room and wave my hand in front when it goes to “clear” it detects movement again. If I am always standing in the room and move around it will not go from a clear state to a detected state. You should be able to see when the motion sensors state is back to off, if you check the states in the frontend, either in the card, or in the more-info screen. It responds rather well, and you can see its behavior perfectly. Up to you if that responsiveness is adequate for your automation. What are the sensitivity parameters which can be used? 1 - 10? End of the day this is the pantry, so it’s not going to hurt to be ultra sensitive. sensitivity parameters which can be used? 1 - 10? What is that card? custom card or you create that? Oh, interesting - it’s already on sensitivity 2. Odd that with even constant movement the sensor doesn’t hold it’s “on” state and it turns it to “off” and won’t change back to the “on” state afterwards for a delayed period. If I wave my arm into the room infront of the sensor and turn the state to “on” then remove my arm for approximately 10-15 seconds the state will change from “off” to “on” again. I only have the pantry sensor setup for 30second, could this time limit be too short for the sensor to handle? Could someone let me know if this is common behavior or something wrong with my setup?